This Tibi sweater is a recent acquisition and I’m obsessed. The sweater is oversized without being too stifling (the knit isn’t constricting) and I love that it isn’t overly fuzzy and doesn’t shed like a lot of other sweaters tend to. This means no little fuzzies getting stuck in my contacts, and let’s be real, I hate that. The print is a cool take on chevron, but the color combo is classic black + ivory so that I can wear it with anything. I wore this look to my interview with Aerin Lauder last week and also for a wine night with my co-workers – super versatile. The other item I want to point out in this outfit are the boots. 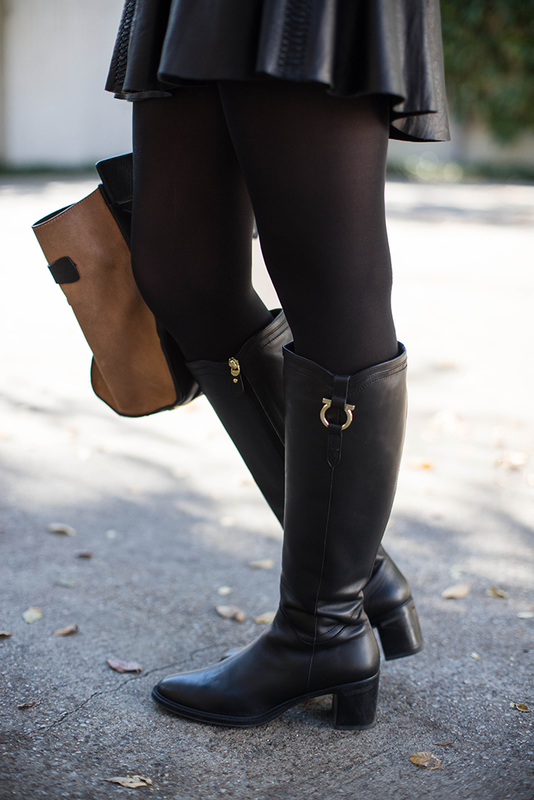 I picked these up in California in August at the Ferragamo outlet store – such a steal and the perfect basic boots, don’t you think? This pair looks pretty much identical. Perfection, love this look from head to toe. Love that you paired the chunky sweater with the pleated leather skirt. Great look and amazing boots! Loving that sweater – such a great find! It looks super cozy – makes me want to curl up by a fire with a good book and some hot chocolate :) happy monday! Perfect Fall look! Also loved your Aerin interview yesterday, really want to smell these fragrances! I’ve been contemplating that sweat for some time now, it looks so comfy and cozy! But oh my goodness, I love that skirt! 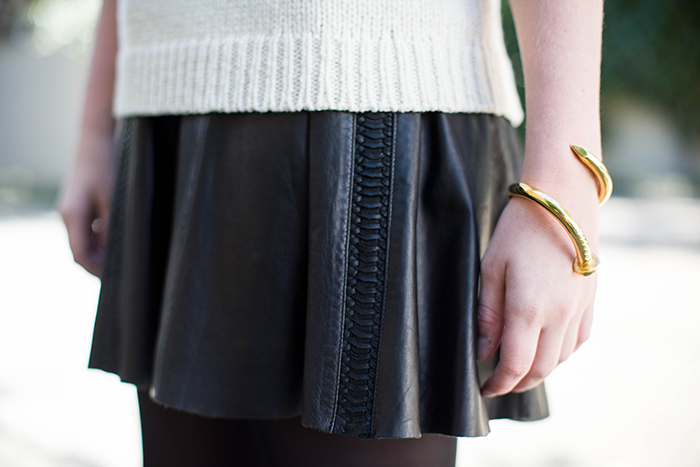 Loving the details on the leather skirt! That pleated skirt is AMAZING! The perfect wardrobe staple for fall and winter. Love how you paired it with the chunky sweater. I love this outfit! So cozy! I really love, love, love the skirt and boots. Your so winter chic! I don’t blame you for being obsessed with that sweater! And such a perfect skirt for that sweater! I love chunky, cozy knits like this. The sweater is so great with that leather skirt (I’ve been searching high and low for a similar one!). Love the sweater and bag! I have the same boots and am in love with them! Love this! Oversized, slouchy sweaters are my favorite and this looks great with the skirt. The design on that sweater is gorgeous, simple and classy. That leather jacket is very fun. And I hate it when dumb fuzzies get stuck in my contacts too..grr! u make them rock !! Love love this! The sweater looks perfect with the leather skirt. The fact that it doesn’t shed is such a plus because I have had plenty that by the end of the day I am covered in fuzz from head to toe. I hate that! And your bracelet is fabulous! oh the detail on that skirt is out of control :) love!